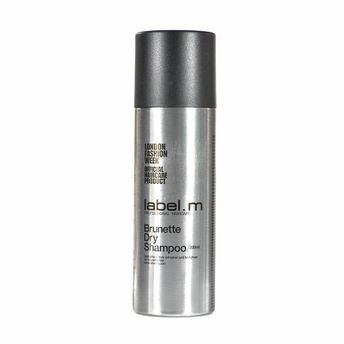 label.m Brunette Dry Shampoo refreshes hair in between shampooing using natural rich starch to disperse oil. Also works as a brilliant matt texturiser for a soft-touch,velvet finish to the hair. Shake can well and hold upright approximately 15 cm from dry hair. What is this product? Matt-effect style refresher and texturizer for brunette hair. Designed especially for brunette hair tones to refresh in between washes or to disperse oil/product overload. This time-saving, style-reactivator blends into hair and restores your look without the need to shampoo. Also works as a brilliant matt texturiser for a soft-touch, velvet finish to the hair. Developed in London for professional hairdressers. About the Brand: label.m formulations are where art collides with science. Created by hairdressers for hairdressers, the dynamic, award-winning collection combines naturally sourced ingredients, essential oils with exclusive label.m technologies. This award-winning fashion-inspired range is developed by professional stylists under the creative eye of a dynamic International Artistic Team led by Toni Mascolo and Sacha Mascolo-Tarbuck. The brand's mission is to inspire and nurture creativity and individuality in professional stylists and clients around the world. The current label.m collection incorporates over 81 products, many of which are free from paraben, chloride and sodium chloride free, categorized into a simple 4C system: cleanse, condition, create and complete. The innovative offering includes label.men, therapy rejuvenating, organic, thickening and brightening blonde collections as well as Lab remedy - the in-salon only professional treatment range. Explore the entire range of Shampoo available on Nykaa. Shop more Label.m products here.You can browse through the complete world of Label.m Shampoo .